Syntasa sits in your big data environment whether it be AWS, GCP, Azure, or on-premise Hadoop. You gain control, security, cost efficiencies, and flexibility, and can adopt new data science features more quickly. Syntasa leverages open-source technologies and centralizes them so that projects that would otherwise take months (or even years) if you internalized them, can be delivered in weeks. Whether it’s GDPR or the pursuit of truly personalized experiences, identity is at the heart of it all. The data fragments are at your disposal, and now you need a tool like SYNTASA in order to enable it. 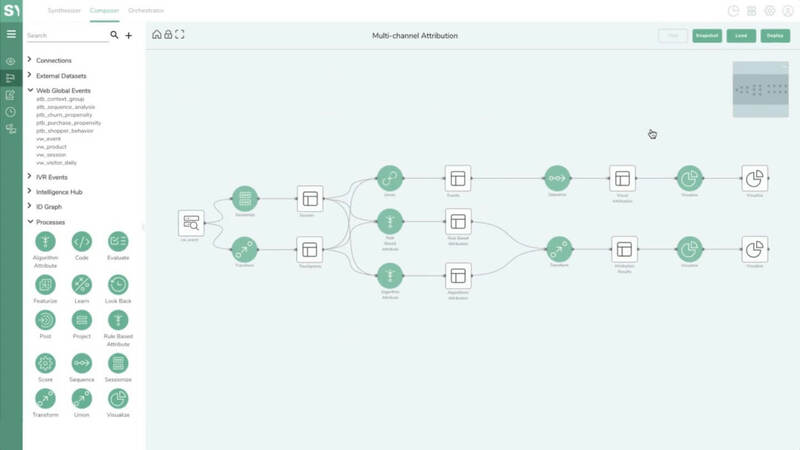 Pre-built data pipeline apps and AI-assisted data management enables teams to automate the ETL process and apply unified behavioral schemas to unlock the true value of the datasets. 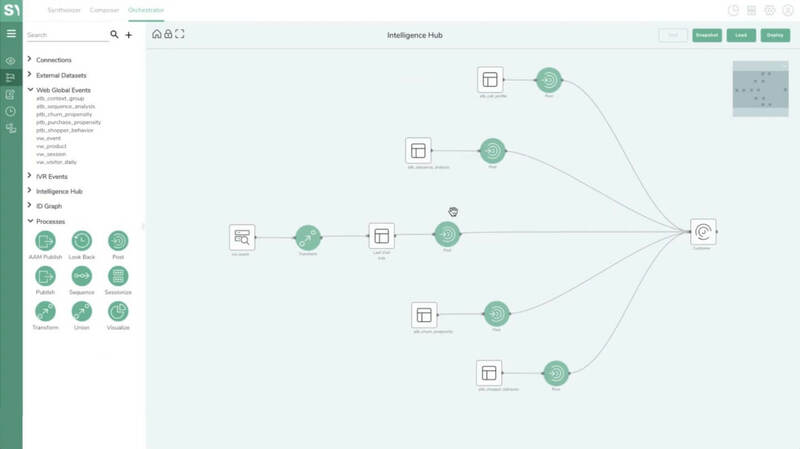 By combining machine learning with our unified behavioral schema, you’ll be able to identify key insights which have statistical significance. IT teams can access insights in real-time without any restrictions. Models built in Syntasa or another open-source tool (SQL, R, Python, Spark, Google Big Query, or others) can be used in a Syntasa workflow, allowing data scientists to easily productionize and perform live testing. Syntasa automatically inherits your security protocols and configures the unified data pipelines to automatically apply preference center settings. This is well positioned to help orchestrate the execution of the user rights under GDPR. SYNTASA accelerates time-to-value through industry best practice app templates, and with the ability to configure and share your own apps through the free-form app builder. 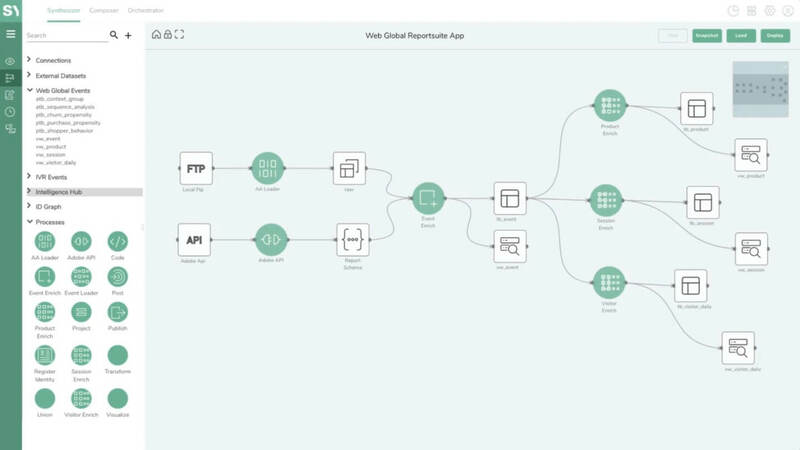 Bring all of your marketing cloud and enterprise data into your big data environment, consolidate it, produce a unified identity graph, and apply AI models to transform it all into intelligent experiences. Synthesizer lets you consolidate data schemas, blend disparate sources (including clickstream and unstructured log data), and unify data via your own comprehensive ID graph. Composer lets you transform your data with AI-assisted use case apps delivered centrally, agnostic of any platform. Orchestrator enables the delivery of near-instantaneous action on learned behaviors and the models you constructed in Composer. Without the constraints of marketing clouds and stack platforms, you now have zero limitations with the channel, technology, or format you wish to activate a decision on. Discover what an AI assisted data-driven enterprise looks like in action.